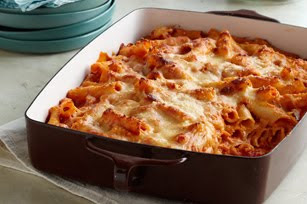 I love some baked ziti and this recipe looks OH SO GOOD! I received it in an email from Kraft foods. This has definitely gone on my "to make" list. -COOK pasta in large saucepan as directed on package, omitting salt. Remove from pan; drain. Meanwhile, add marinara sauce, tomatoes and cream cheese to same pan; cook on medium heat 5 min. or until cream cheese is melted and mixture is well blended, stirring frequently. Return pasta to pan; mix well. -LAYER half the pasta mixture in 13x9-inch baking dish; cover with layers of sour cream, 1 cup mozzarella and remaining pasta mixture. Top with remaining mozzarella and Parmesan. -BAKE 20 min. or until heated through. The pasta dish may be covered and refrigerated up to 8 hours before baking. Increase baking time to 30 to 35 min. or until heated through. If ziti is unavailable, substitute other types of tubular pasta, such as penne, mostaccioli or rigatoni. That dish looks AMAZING! I’m such a sucker for pasta…especially when it’s covered in delicious cheese! I’ll definitely be giving that a try!